2017 was an important year for us. Going through internal changes, collaborating with people we have never worked before, and finally recovering from the dramatic events happened in 2016. Despite all the difficulties, we believe this year has been very rich with updates; therefore, it is only right to wrap it up in the same manner. Hopefully, you are still sober because we have quite a few things to release today. Server clans take a major part in our community. We currently have almost 1,500 clans, which we could not be happier about. It is a huge milestone, and we see great potential in this field. Thus, it is time to bring it to a whole new level. 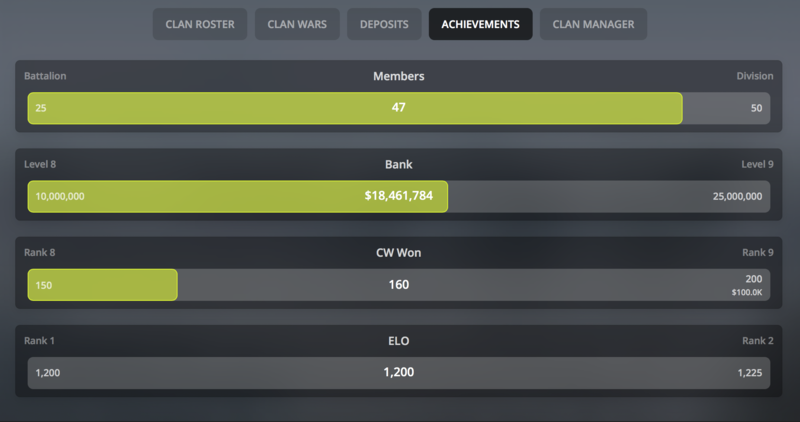 Until now, CW statistics and ratio were the main things to compare clans. Even though it represents activity, it does not represent strength. Decent statistics can be easily farmed by playing against smaller/weaker clans. 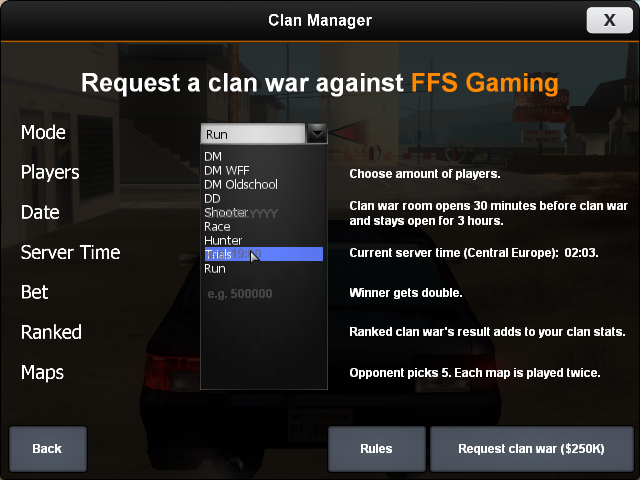 We would like to add more competitiveness and something that would allow us to define real clan’s skills. 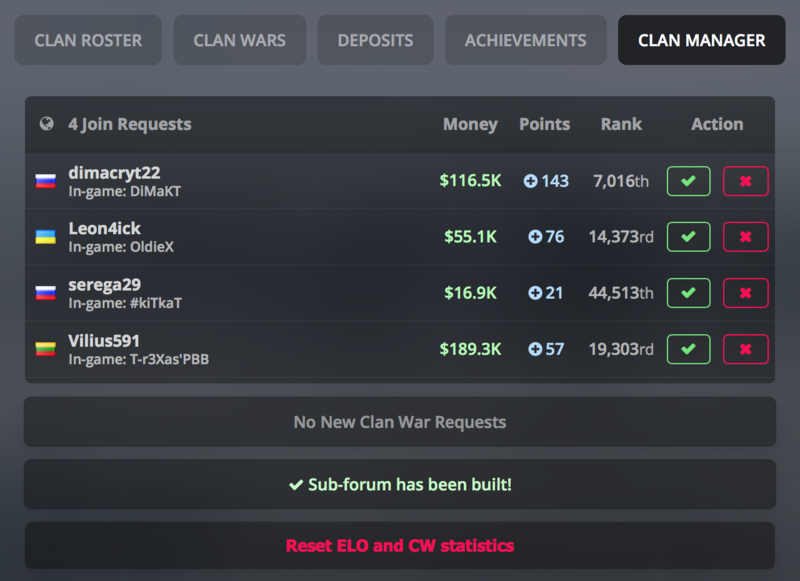 All clans start with 1,200 ELO points. 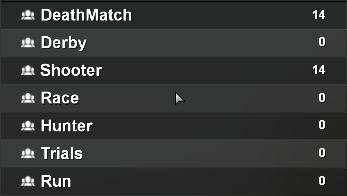 It will take some time till your rating balances out, but eventually it will represent true level in the leaderboard. Only ranked clan wars affect the rating. 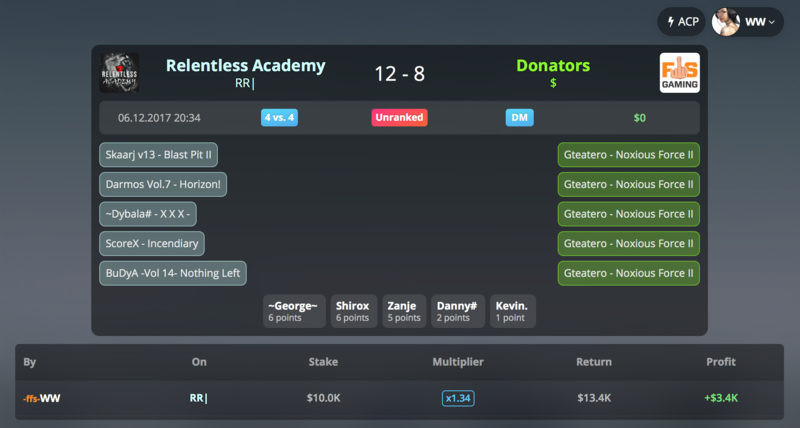 Introducing a whole new betting system with dynamic coefficients and multipliers. Unlike the default bets between the opponents, it is available to all players. Simply find upcoming clan war in the schedule, choose your favorite team, bet desired amount and collect the prize. It is now deeply integrated into our forum. Basically, most of the actions are now available right from the website. It all happens in real-time. 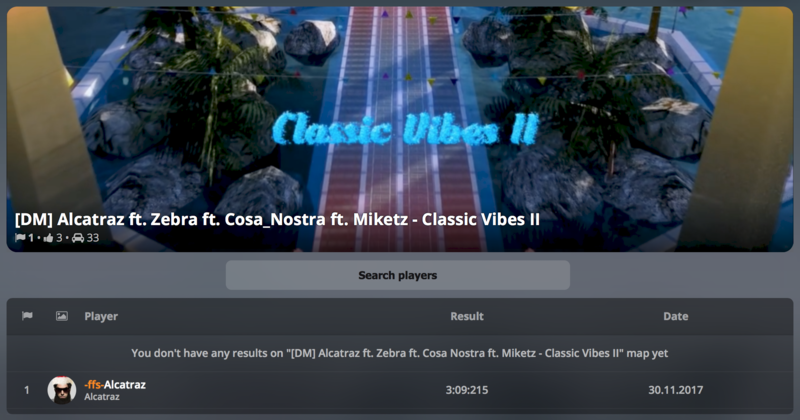 Kudos to @Micra who has done an incredible job developing new CW modes for you! Two new ranks have been added to the system. It is now more flexible, and provides greater control over your roster. Trials - rather decorative rank for now, but can be useful to warn misbehaving members via demotion. Accepted recruits will have this rank by default from now on. The design has been refreshed with dynamic backgrounds and new icons to match website look. Most importantly, we are also introducing new types of notifications. 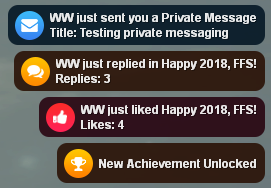 Personal Notifications which work in real-time. 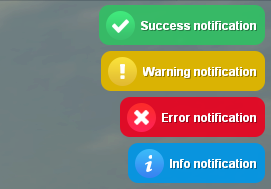 These notifications are as colorful and vibrant as before so that you can easily spot them while being focused on your gameplay. Kudos to @Micra once again for developing something really awesome for DD, Shooter & Hunter arenas. 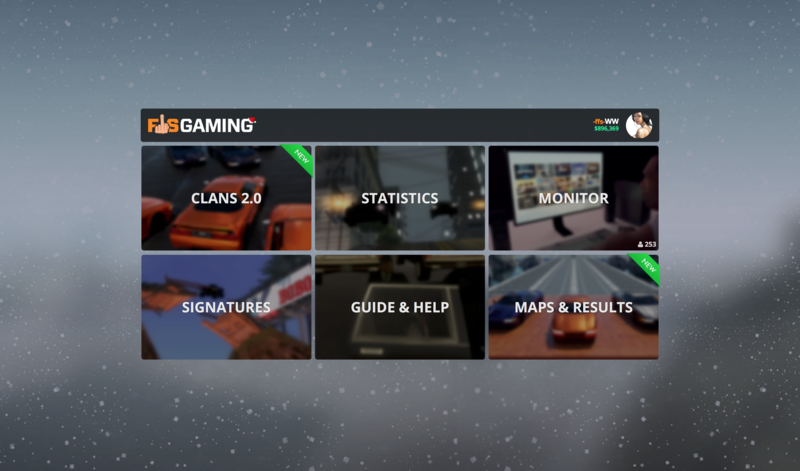 Introducing Top wins - an alternative to top times for non-race gamemodes. It is sorted by amount of wins per map. We have had "Server" tab in the top menu on our forum almost from the very beginning. Interestingly enough, it has never had its dedicated page. Well, not anymore. 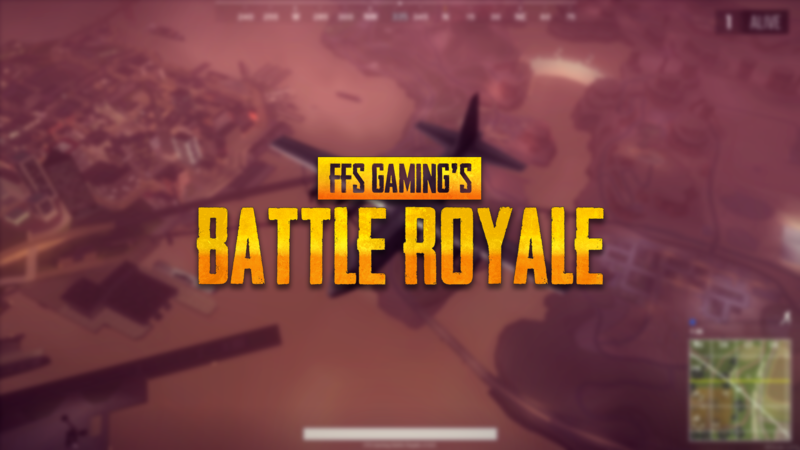 Website Lobby is very similar to the server's lobby. In addition, our administrators are able to delete top times right from the website. It will result in a faster cleaning, which was extremely frastruating due to lack of the system and a need to join the server & setting needed maps. 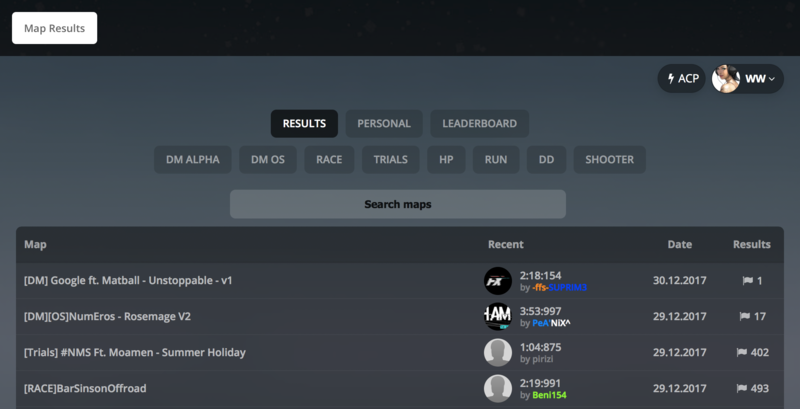 *Maps & Results page is in BETA status. 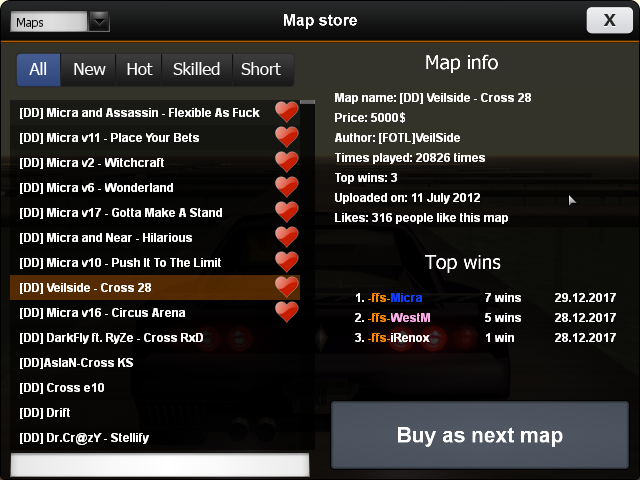 Some maps & toptimes might be missing! We have heard your countless requests to add abilities to disable CW private messages and Royal League badge. Finally, the suffering is over now. You can update your settings here. For the first time at FFS, all the money and points you receive during the following 7 days are doubled! Obviously, following our best traditions, everyone gets Donator status for this period as well. Last but definitely not least! Our development team is working hard on something big for Q1 2018. We sincerely hope you love these updates just as much as we do. We will always continue to work hard, and stronger than ever - FFS Gaming wishes you a Happy New Year! Sidebar Store: updated the lights pack: added 5 new ones. A total of 51 lights available for you now! Congratulations to everyone! truly deserved it. Beautiful changes and sneak peek as well, good work. Last edited by Corex#; 31-12-2017 at 18:05. Last edited by starsetKFC; 31-12-2017 at 11:19. Congratulations to new Trials and new updates!